Supporters of action on climate change must borrow a page from FDR by laughing off critics—recognizing that there are times when we must indeed be radical. 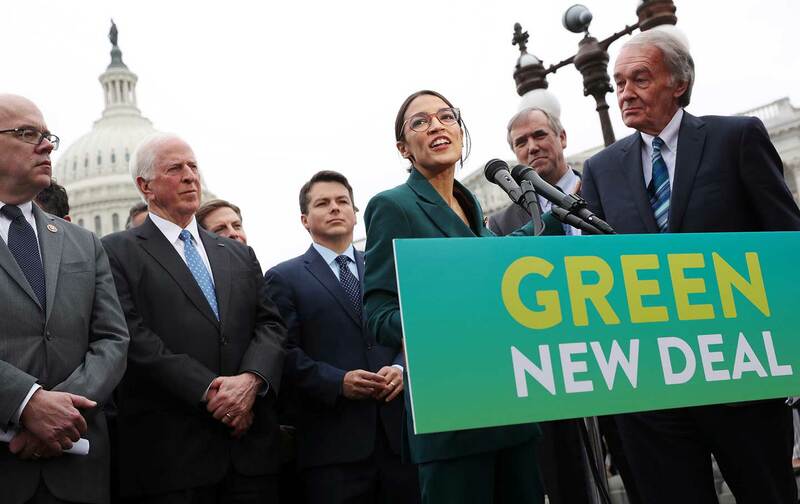 Republicans in Congress say the Green New Deal is “radical.” Excellent! Even before a historic congressional resolution to address climate change and create jobs was introduced last week—in the House by Alexandria Ocasio-Cortez with backing from Congressional Progressive Caucus co-chairs Mark Pocan and Pramila Jayapal and in the Senate by Ed Markey with backing from Democratic presidential prospects such as Bernie Sanders, Elizabeth Warren, Kamala Harris, Cory Booker, Amy Klobuchar, Kirsten Gillibrand, and Jeff Merkley—the Republicans pounced. The reactionaries who represent the nation’s fossil-fuel industries griped that the Green New Deal would negatively impact their paymasters. Thank you, Senator Barasso. Thank you, Congressman Shimkus. Thanks to all the reactionary Republicans and docile Democrats who are doing their best to portray the Green New Deal as “radical.” Please, please keep it up. Climate change represents a stark threat to the planet and the people who inhabit it. When Pocan says “we can’t afford to wait any longer and need to take action on climate change,” he’s right. The United Nations Intergovernmental Panel on Climate Change warns that dramatic action will be required over the next 12 years to avert environmental and economic disaster. So a radical solution is called for. No one should make apologies for recognizing this necessity. Radical change goes to the root of the problem and addresses it. The details of the Green New Deal are up for debate, as were the details of the original New Deal. FDR taught us that responses to historic challenges develop as an understanding of crises evolves and a real sense of urgency takes hold. Those who seek to divide us against one another say this is impossible. Don’t believe them. FDR’s New Deal proposals to address the economic crisis that extended from the Great Depression were attacked as radical too—even before he and his brain trust had developed specific programs. Why? Because entrenched special interests are always frightened by the prospect that government might get focused on addressing serious problems with serious proposals. To the people of the country I have but one answer on this subject: Judge me by the enemies I have made. Judge me by the selfish purposes of these utility leaders who have talked of radicalism while they were [defrauding] the people and using our schools to deceive the coming generation. My friends, my policy is as radical as the Constitution of the United States. I promise you this: Never shall the federal government part with its sovereignty or with its control of its power resources while I’m President of the United States. When critics called FDR radical, he embraced the term. “There is no question in my mind that it is time for the country to become fairly radical for at least one generation,” he explained in the early 1930s. Supporters of a Green New Deal should borrow a page from FDR by laughing off the critics and by recognizing that there are times when the United States must, indeed, become fairly radical.